Conniff Construction has been providing Central NJ with Residential & Commercial Construction Services for over 40 years. Our reputation of being fair, honest and always upfront with our clients has led us to be one NJ's premier General Contractors. With award winning superior service, we were voted Best of Houzz for Service for the last 3 consecutive years. With unparalleled craftsmanship, we where awarded NARI NJ Contractor of the Year '18 for one of our projects! Our team is dedicated to ensuring your construction experience will be as easy and stress-free as possible.  Conniff Construction is a leading general contractor serving residential and commercial customers throughout Toms River, New Jersey and surrounding areas. We specialize in both residential and commercial construction, including new homes, remodeling renovations and additions. We are a fully licensed general contractor offering a wide range of services to suit your individual needs. Our unique blend of quality service, vast experience and reasonable pricing has earned us the reputation that we firmly stand behind. Conniff Construction has been providing outstanding commitment and craftsmanship to every project for more than 40 years. We pride ourselves on doing an exceptional job that will look stunning and stand the test of time. With an expert staff of construction, remodeling and real estate professionals, you can be assured that your life’s biggest investments are in good hands. "Fred and I want to sincerely thank you for an excellent job! The family room addition and kitchen renovation will make our daily lives function much better and the overall transformation is stunning. We have done many home renovation projects throughout the years and the interviewing process is not a task that any homeowner looks forward to. We believe we made the best choice – Conniff Construction." “I hired Conniff Construction to remodel my master bath. I met with Sean Conniff to discuss the plans; each time, Sean recommended significant improvements to the remodel. Conniff Construction is a trusted company whose team of craftsman display superior skill and finished construction . I’ve not found a contractor in this area who can equal Sean Conniff and his crew. You won’t be disappointed, he’s what a contractor is suppose to be." "I used CC in ’11 to do a bathroom remodel. Everything was great, but the best part was John suggested we include a small hallway between the bedroom and bathroom (it’s an old house so no ensuite bathrooms), he used an exisiting closet to make that happen, and we LOVE it!! Don’t know how we lived without it before!!"